(Nanowerk News) An important model to explain high-temperature superconductivity is the so-called ‘quantum spin liquid’. Scientists are therefore interested in understanding the low-energy excitations of this magnetic state. Now, a theoretical study by a research team from RIKEN and the Massachusetts Institute of Technology, USA, has explained how the properties of spin liquids could be revealed by a simple heat-transfer experiment ("Theory of the Thermal Hall Effect in Quantum Magnets"). 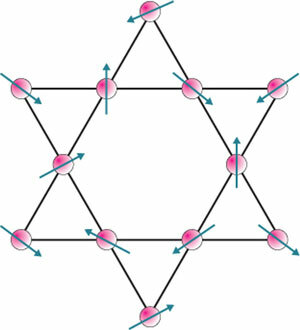 In an insulating magnetic crystal, the electronic spins are localized to the atoms that form the crystal lattice. For most such magnets, or antiferromagnets, the chemical bonds favor an arrangement where, at low temperatures, each spin points in a direction opposite to that of its neighbor. However, on a triangular lattice, such as the ‘Kagome lattice’ (Fig. 1), a spin cannot simultaneously be opposite to all of its neighbors. The spins in these magnets never order, even at very low temperatures—giving rise to the name quantum spin liquid. Figure 1: A schematic of electron spins on the Kagome crystal lattice, named for its similarity to a form of Japanese basket weaving (the spheres denote atoms). The Kagome spin lattice is believed to be an example of a spin liquid. To date, however, few experiments have found spinons. Nagaosa and his collaborators explain how a method similar to the so-called ‘Hall measurement’—an indispensible technique for studying the properties of semiconductors—could be used to detect spinons. In the classic version of the Hall measurement, a magnetic field is applied perpendicular to a charge-carrying current, causing positive charges to curve one way and negative charges the other. The deflection of the charges provides information about their properties, including their sign. In the ‘thermal Hall effect’ considered by Nagaosa and his colleagues, temperature serves as the driving force to create a current—not of charges, but of magnetic excitations—that flow in a magnetic field. For a spin liquid, these excitations are the spinons. As in the classic Hall effect, a magnetic field will deflect these excitations, which will change the direction of the heat flow—an effect that experimentalists should be able to measure. Nagaosa and his colleagues showed that while there is no thermal Hall effect in most conventional antiferromagnets, the presence of spinons in a spin liquid would result in a clear effect. This experimental probe could therefore become an important way to identify and study excitations of quantum magnets.